At Derby High we are proud to offer a huge amount of STEM based activities to support our students' learning in the areas of Science, Technology, Engineering and Maths. We are prouder still of the larger number of students who take choose to take part in the STEM based activities on offer, often outside of school hours. 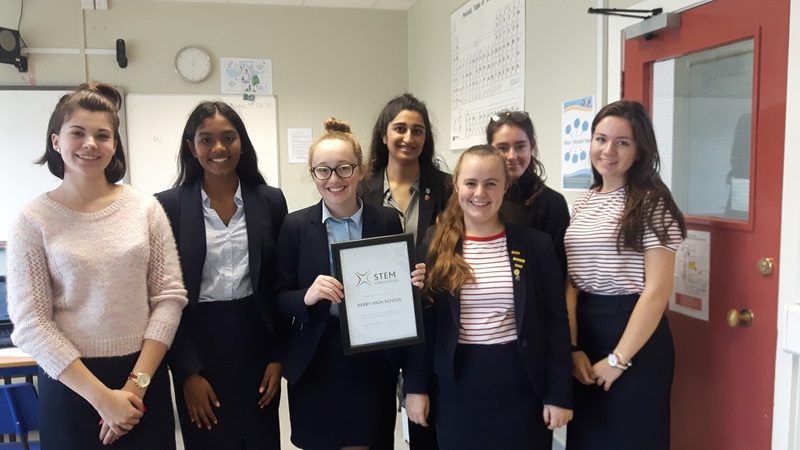 We have recently won an award from STEM Learning UK in recognition for the work we do in raising awareness and engaging students in STEM activities in school. Last year we set up a STEM tutor network where older students tutor our younger students in STEM subjects. 11 Derby High students achieved Silver CREST awards last year after many months of hard work. These awards were worked towards via projects such as Go4set, research into embryonic stem cells, the scientific theory of instellar travel and the future of solar powered vehicles. We currently have a team of 3 students who are working towards a Gold CREST award.